Gold Pros address, phone, website, and more. 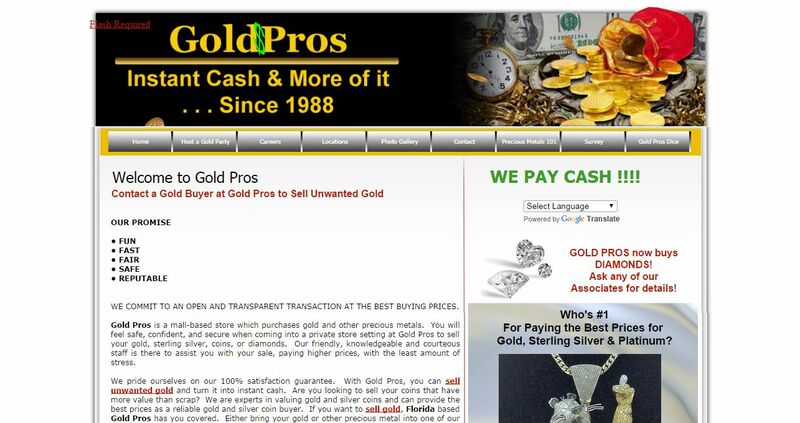 Gold Pros is a mall-based store which purchases gold and other precious metals. You will feel safe, confident, and secure when coming into a private store setting at Gold Pros to sell your gold, sterling silver, coins, or diamonds. Our friendly, knowledgeable and courteous staff is there to assist you with your sale, paying higher prices, with the least amount of stress. We pride ourselves on our 100% satisfaction guarantee. With Gold Pros, you can sell unwanted gold and turn it into instant cash. Are you looking to sell your coins that have more value than scrap? We are experts in valuing gold and silver coins and can provide the best prices as a reliable gold and silver coin buyer. If you want to sell gold, Florida based Gold Pros has you covered. Either bring your gold or other precious metal into one of our convenient mall locations or have fun hosting a gold party.